Attention moms, dads, grandmas, grandpas, and everyone in between: Toys”R”Us unveiled on Sept. 7 its 2017 Holiday Hot Toy List. As the leading expert on all things toy, the Toys”R”Us team has traveled the world over the past two decades to uncover hot trends and toy phenomena like Tickle Me Elmo, Zhu Zhu Pets, Hatchimals and more, so they can provide parents and gift-givers with the inside scoop on kids’ most-wanted playthings. This year’s list is no exception, featuring items from Hatchimals Surprise to PAW Patrol Sea Patroller and more than 20 items available exclusively at Toys”R”Us (cue Luke Skywalker’s Landspeeder). Sony Music announced on Sept. 7 the release of “Fantasy,” a single by the late George Michael featuring Nile Rodgers. First recorded by the superstar in the late 1980s, the track was intended to be featured on Michael’s second solo album, the multi-platinum, Listen Without Prejudice Vol.1, but was left off. It was subsequently a B-side of the U.S. release of the single, “Freedom! ’90” and on the U.K. version of the single, “Waiting for That Day” in 1990. But as one of his favorite tracks, Michael always intended for “Fantasy” to be a single in its own right. On Sept. 29 Epic/Legacy Recordings, in collaboration with the estate of Michael Jackson, will release Michael Jackson Scream, a collection of 13 of his all-time most electrifying and danceable tracks including “Ghosts,” “Torture,” “Thriller,” and “Dirty Diana.” Additionally, Scream includes a newly created bonus track, “Blood on the Dance Floor X Dangerous,” a high-energy five-song mashup from the acclaimed remixer the White Panda, who created a seamless new musical experience. The Las Vegas Convention & Visitors Authority (LVCVA) introduced its new “What Happens Here, Stays Here” broadcast and digital spot, “Dream Vacation.” The legendary brand’s innovative spot reinforces the destination’s identity as the paramount purveyor of adult freedom. A casual meal takes an unexpected turn when a woman reflects on her recent Vegas vacation in what she thinks is a daydream, only to discover her memories are playing out for all her friends to see. In a panic, she pops the looming dream bubble, ensuring what happened in Vegas, stayed in Vegas. Dutch Boy Paints, an industry leader in innovative, high-quality paint products, is proud to announce Sandstone Tint (441-2DB) as the brand’s Color of the Year for 2018. Identified by Dutch Boy Paints’ color and design team, this warmer neutral emerges as the leading color from a four-trend color story that draws inspiration from current cultural happenings such as travel, diversity, technology, and home décor. Eighty years after the launch of White chocolate as the third type after Dark and Milk, Barry Callebaut, the world’s leading manufacturer of high-quality chocolate and cocoa products, reveals the fourth type in chocolate “Ruby” which is made from the Ruby cocoa bean. 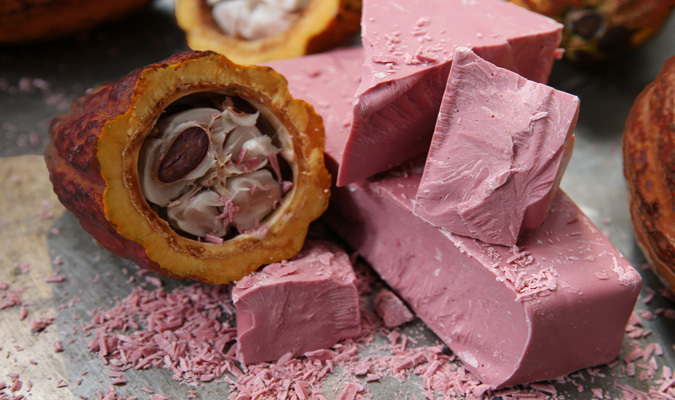 Ruby chocolate has an intense taste and characteristic reddish color. The Ruby bean is unique because the fresh berry-fruitiness and color precursors are naturally present. The cocoa beans are sourced from different regions of the world. The bean has a specific set of attributes, which Barry Callebaut managed to unlock through an innovative process that took many years to develop.